Qiangba Puncog, chairman of China's Tibet Autonomous Region, poses for a photograph with members of the Tibetan provincial delegation as they arrive at the Great Hall of the People, for the start of the National People's Congress in Beijing on Thursday. BEIJING -- China’s ruling Communist Party on Friday declared Tibetans were “very happy” even as six Tibetans reportedly self-immolated over two days this week to protest Chinese rule. The reported incidents made this week the deadliest since human rights groups began tracking self-immolations in March 2011. More than 60 Tibetans have now taken their own lives in protest of Chinese rule since then, according to Tibetan activists. The reports came the day after China opened the 18th Communist Party Congress, during which a once-a-decade leadership change was slated to occur. "Ordinary people and monks in Tibet are not willing to set themselves on fire, and they also oppose self-immolation, they are very satisfied with the society,” Qiangba Puncog, Chairman of the Standing Committee of the People’s Congress of the Tibet Autonomous Region, told foreign and Chinese journalists. “Happiness is comparative. 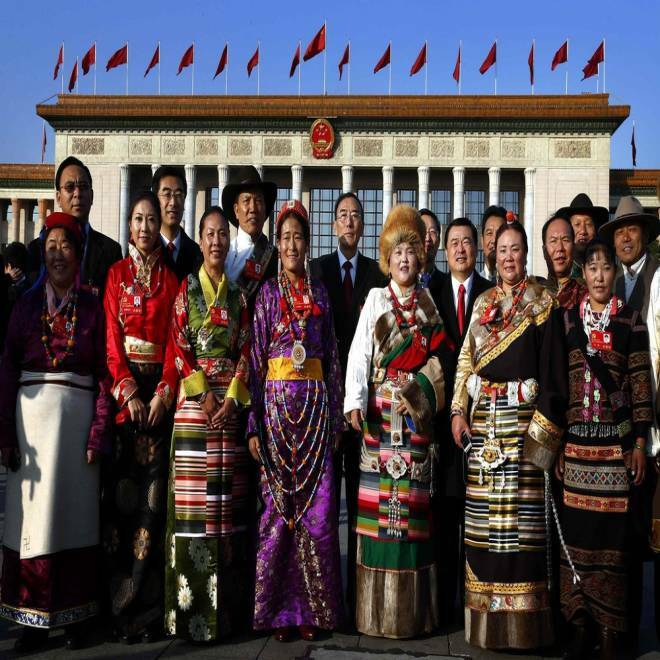 They feel very happy,” Puncog said as members of the delegation from the Tibet Autonomous Region met with foreign and Chinese journalists. At the same event, the deputy governor of Tibet blamed outside Tibetan exile groups and Nobel Peace Prize winner, the Dalai Lama, for any bad press and trouble in Tibet. "The overseas Tibetan separatist forces and the Dalai clique do not spare sacrificing people's lives in order to achieve their shady political goals, we believe this goes against human nature and morals,” Lobsang Gyaltsen said. “They will not succeed in achieving their evil goals, and they will certainly be severely condemned." Beijing has long tried to paint the restive region as one of the more content, peaceful areas of China. A survey this year by China’s state media, Xinhua, called the capital of Tibet, Lhasa, “The happiest place in China." Twenty-four hours after President Barack Obama was re-elected to the White House, the world's other major power, China, began the very different process of choosing its new leader. It happens once every ten years, and lasts just a week. And in case there was any doubt, the ruling Communist Party began by pledging never to have Western democracy. NBC's Angus Walker reports. That point was apparently hammered home again Friday, as Barbara Demick of the Los Angeles Times tweeted a conversation she had with one delegate who again claimed Lhasa was the happiest place in China. Despite the lofty title and plans to pour $47 billion into the region by 2015, resistance to what many ethnic Tibetans view as the “Sinicization” of their culture has been strong, prompting much speculation that opponents within China would use the closer media attention on China during the Party Congress to protest. That speculation has proven true. Besides the self-immolations earlier this week, unconfirmed reports on Tibetan exile group websites began to surface about mass demonstrations that had broken out against the government Thursday and Friday in Tongren, a town in China’s southwestern province of Qinghai. 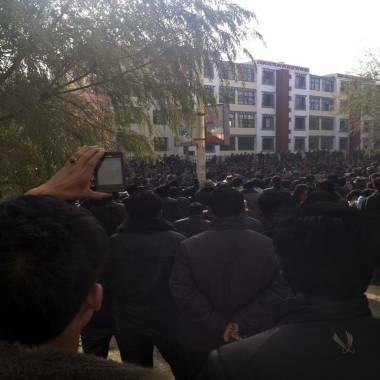 According to the Tibetan news service, Phayul, as many as 10,000 Tibetans participated in protests in this quiet monastery town to protest the strict security measures in place since ethnic unrest began in the region. Hundreds of Tibetans protest in the Rongwo township in Rebkhong county, in western China's Qinghai province, on Friday. The protesters were said to be reciting ancient Tibetan prayers and calling for the return of the Dalai Lama to Tibet. NBC News could not independently confirm the protests. If true, they would represent a significant test to Chinese rule on the eve of the critical leadership change. Any challenge would surely not go unpunished by local officials. An officer reached by phone at the Tongren County Police station told NBC News he was new to the force, but had “never heard of self-immolations or protests in the area.” He also did not know if police had been sent elsewhere in the county to quell protests. NBC News’ Yanzhou Liu contributed to this report.